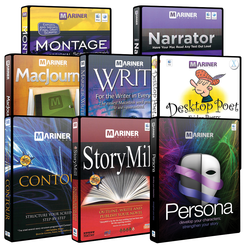 The Mariner Writer’s Suite is a bundle of the best Mac writing software. Enjoy Montage, MacJournal, StoryMill, Persona, Mariner Write, Contour, Narrator, and Desktop Poet for Mac - all eight apps for one great price! Read stories, plays - any kind of text - out loud with Narrator. Using the rich voices supplied in the Mac OS X (especially those in the Lion operating system) system you choose a voice actor - adjusting speed, pitch and inflection - to add personality to your text. Totally revamped with a host of new features, MacJournal 6.0 is the best MacJournal yet. Take advantage of new views, like the Timeline or Calendar. Assign moods, geolocation, or a book setting to your journal. Whether you want your journal to be your-eyes-only or you want to share it with the world, MacJournal 6 is there for you. Boasting an elegant interface, Mariner Write is one of the most streamlined Mac OS X word processors on the market. Write has everything you need to create great looking documents - even easily handling MS Word files. Desktop Poet is 'fridge poetry' for your Mac! Choose from hundreds of word tiles and compose imaginative prose by forming words into sentences or phrases or to take a break from the stress of life! Turn your idea into a solid outline like the character-based structure used by many blockbuster movies. Contour shows you what elements need to be in your script. Mac and iPhone supported. Part word processor, part database, StoryMill provides every author with the tools essential to writing a best seller: everything from project-wide annotations to centuries-spanning timelines. StoryMill empowers you to write. Develop your characters and strengthen your story with Persona. Packed with archetypal themes for heroes, heroines, villains and villainesses, you can craft all the characters for your story.